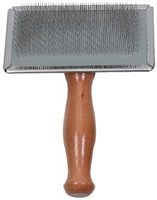 When using a slicker brush it is advisable to run the brush gently through the whole coat starting from the head towards the tail, flanks and belly. Do not press the slicker too hard into the coat of your dog as this could cause the slicker to burn the skin. 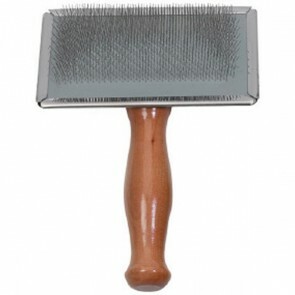 Please note slicker brushes should not be used on smooth thin coats where hair matting is very unlikely. Slickers with rubber filaments are very good for getting rid of unwanted surface dog hair and massaging the coat. Wooden Grooming Slickers are available in a variety of sizes, with fine and medium course filaments to match the size of your dog. Slickers: 5 stars out of 5 based on 0 user reviews.